Microsoft is constantly trying to supply users with a more stable and secure system by performing more frequent updates for Windows 10. On the other hand, those users listed over 30 errors related to Windows 10‘s system update. And some of those are a tough nut to crack. One of those annoying errors is linked with the code 0x8024a10a. According to numerous users, this error occurs both on PCs and Windows-powered smartphones. It completely shuts down the update process. On the other side, Microsoft is not addressing it as it should. So, we’ll try and clear things up with this article. 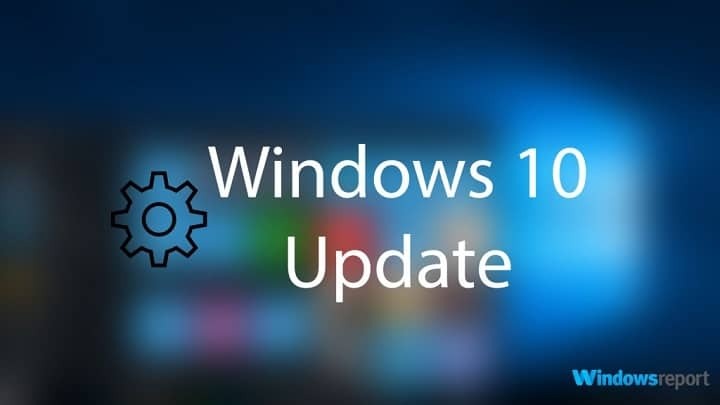 Windows 10 not updating, cannot update – The main problem with this error is that it will prevent you from updating your PC, but you should be able to fix it by using one of our solutions. 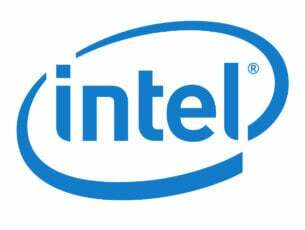 Update error 0x8024a10a laptop – This issue affects both laptop and desktop PC, and if you encounter it, you might be able to fix it by temporarily disabling your antivirus. 0x8024a10a Windows 10 update – According to users, this error occurs mostly while trying to download new updates. To fix the problem, reset Windows Update components and check if that helps. Some users reported that, on some occasions, third-party antimalware software slowed down or even stops the Windows update process. 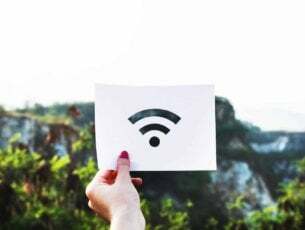 Using an antivirus tool is important if you want to protect your PC from online threats, but sometimes your antivirus can interfere with your system and cause this error to occur. To fix the problem, it’s advised to disable certain antivirus features and check if that helps. If that doesn’t work, your next step would be to disable your antivirus altogether. Even if you decide to do that, you’ll still be protected by Windows Defender, so you don’t have to worry about your safety. If the error code still appears, you might have to remove your antivirus to solve this problem. If removing the antivirus fixes the issue, it might be a good time to consider switching to a different antivirus solution. 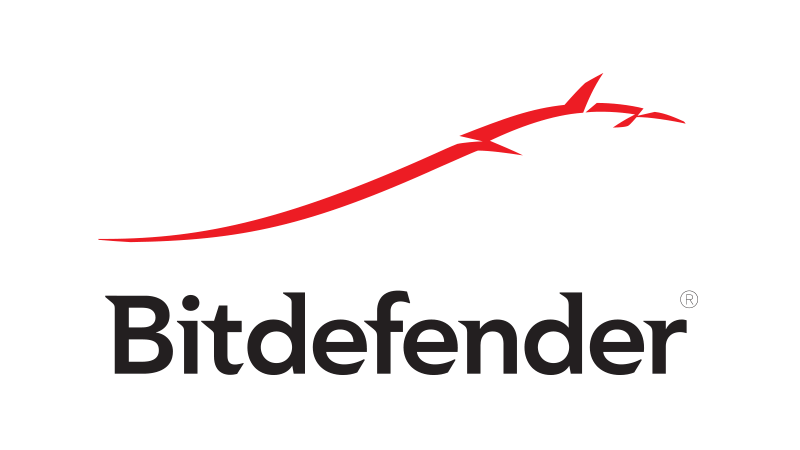 There are many great antivirus tools, but if you want maximum protection that won’t interfere with your system, we recommend to try out Bitdefender. Additionally, it is a good idea to disable your VPN while updating. The process should last for approximately 5 minutes. After it’s done, restart your PC and try updating again. Once the DISM scan is finished, check if the problem is still there. If the issue persists, or if you were unable to run SFC scan before, repeat the SFC scan and check if that helps. Go to Services tab and check Hide all Microsoft services box. Then click Disable All and press Apply. 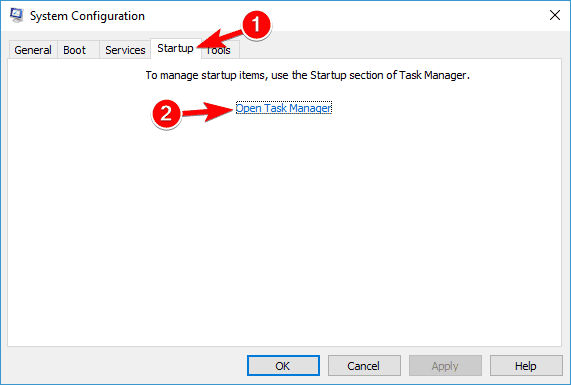 Disable all Startup programs individually and press OK. If the problem is persistent, you can move to the final step. 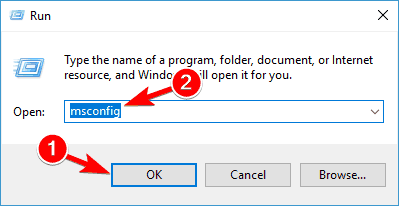 Additionally, If you are keen to retrieve past configuration, you can do it easily by returning to System Configuration and Task Manager respectively. Just enable disabled processes and you are good to go. If you have issues with update error 0x8024a10a, the problem might be related to Windows Update services. 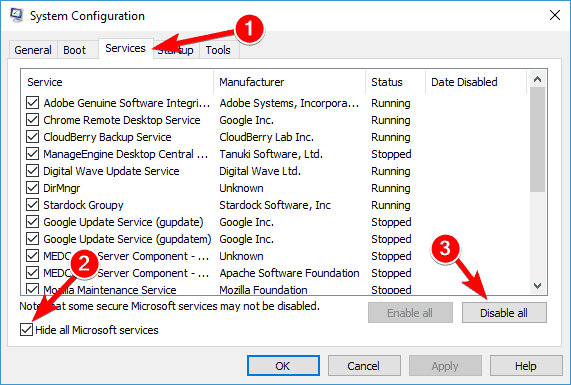 Sometimes issues with services can be resolved simply by restarting them, but there are multiple services related to Windows Update, so restarting them all by hand can be a time-consuming task. However, you can always create a Windows Update reset script that will reset all necessary services for you. This process is quite simple, and you’ll have your script ready in a matter of minutes. Once you create a script, just run it and the problem will be resolved. In the left pane, select Troubleshoot. Select Windows Update from the right pane and click Run the troubleshooter button. First, you need to find out the code of the update you’re trying to download. To do that, simply go to Windows Update and check the code of the update you’re trying to install. The code will consist of an array of numbers and KB letters at the beginning. Once you find the code, copy it or write it down. Go to Microsoft’s Update Catalog website. 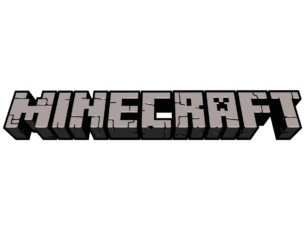 Now enter the update code in the search bar. List of results will now appear. Select the update that matches your system architecture and click Download. After downloading the update, run the setup file and you should be able to update your system. Wait while the application prepares your PC. Now choose Download and install updates and click Next. Wait while the updates are downloaded and follow the instructions on the screen until you get to the Ready to install screen. On Ready to install screen, click Change what to keep. Now select Keep personal files and apps and click Next. Once the installation is finished, you’ll have the latest version of Windows 10 installed and the issue should be resolved. In case all of the above steps proved futile, you may consider reinstallation as your easiest solution. We are aware that can take some time, but installation process for Windows 10 is not lengthy nor hard to perform. We hope you managed to fix your update issue with these workarounds. If you have any questions or doubts, be sure to address them in the comments section below.